Article: Can Ryne Harper Continue His Early-Season Success? Article: Get Buck in Here – Moving Time? Twins 9, Astros 5: Hip Hip, JORGE! Joe Mauer is the best player in modern (post-2000) Twins history. Byron Buxton could be in line to succeed him as face of the franchise. These are very important players, not to mention very likable players. So it creates an awkward situation when their own best interests conflict with those of the Twins. But the team must come before the player. And that's why it should not be a given that Mauer returns in 2019, nor that Buxton returns in September. Let's start with Joe Mauer. Mauer has been climbing toward the top of franchise record books this season. Most recently, he became the third Twin ever to reach 1,000 runs scored, days after passing Rod Carew for second on the all-time hits list. As the 35-year-old checks off these estimable accomplishments, it's easy to get caught up in the nostalgia of his former greatness. But the truth is that Mauer hasn't been a great player in five years. The closest he came was last year – a genuinely solid season – but in 2018 he has returned to the same mediocre rate of production that's been customary since his move to first base. Watching him play, one can't be blamed for exaggerating Mauer's impact. He has legitimately been one of the best clutch performers in baseball this year. Almost every hit he collects these days seems to knock out another milestone. Plus, there's the exemplary plate approach, and the sterling defense. But from an objective standpoint, Mauer just hasn't been much of a difference-maker. At all. Both Fangraphs and Baseball Reference have him pegged at less than one win above replacement level. His .729 OPS ranks 111th in the majors. His raw strength, never a true asset, is clearly diminishing – Mauer has gone long stretches of this season with absolutely no power output. His middling walk rate doesn't make up for the lack of bat. Other than wishful thinking, I'm not sure what'd make anyone expect this to change for the better in 2019. Realistically it seems far more likely he'll lose a little more bat speed, and a little more reaction time. Mauer is not a net negative to the team right now but he isn't far off, and there will be ample opportunity to find a significant upgrade during the offseason. Yet, so many people are deferring to Mauer completely on this decision. I've seen it from fans and media. I've seen it (more understandably) from coaches and teammates. If Joe wants to come back, and will accept a reasonable contract, he's back – so goes the prevailing wisdom. Conspicuously, it's not a stance that has been openly taken by Derek Falvey or Thad Levine. Personally, if he'll come back on a low-cost one-year deal, and is open to a more limited role, I'm not opposed to Mauer coming back. But his well-earned status shouldn't dictate the club's path. Why do so many otherwise logical folks feel it should? Now, as for Byron Buxton. I laid out my feelings regarding the Buxton situation two weeks ago when he came off the disabled list at Triple A. But he became a topic of discussion again on Wednesday night when Paul Molitor stated that a decision hasn't yet been made regarding his fate for September. My thought when he was activated was that Buxton should be able to earn his way back up. Has he? Well, he's been hitting for a ton of power at Rochester, with nine extra-base hits and a .659 in 10 games. It's absolutely been his best burst of offense all year. But he also has drawn one walk in 46 plate appearances, with 10 strikeouts. And when talking to reporters, Molitor notably pointed out that Buxton's been "pulling the ball at a high rate." That hasn't always been a great indicator for him in the past. Buck's results are obviously back where the Twins want them; one wonders about the process. Again, it can't be overstated how valuable that extra year of service time will be in 2022, when Buxton is 28 (for relevant perspective, Aaron Hicks is 28 now). Whether the front office is running out the string on his service clock, or engaging in extension negotiations, or discussing trades with another team – from any perspective, it's just really key. So I can see why this is a much trickier equation than some make it out to be. Especially when you consider the inherent questions around Buxton's health (which would seemingly benefit from an extra month's rest tacked onto his offseason), and the lack of available playing time in the Twins outfield. When asked, Falvey said they're not factoring Buxton's team control into their thinking (what else are ya gonna say), but the truth is that even negating that, there's still a case for holding off – albeit a slightly weaker one if his average is still close to .400 in a week. I'm happy not to be the one making the call. The fan in me wants to see Buxton in September and Mauer in 2019. But the more analytical side, thinking strategically and strictly for the good of the team, feels more conflicted – especially with regard to Mauer. When Falvey and Levine were brought aboard, the hope among so many of us was that they'd be guided less by sentimentality, and more by data, logic, shrewd reason. Because of this, I'm a little surprised by the unpopularity of either scenario – opting to part ways with Mauer this offseason, or leave Buxton out this September – even among people I almost always find myself in agreement with. 20 games in September of a non-playoff season or a full season of Buxton at age 28. All else being equal, it's an easy choice. But in reality, it's not. The front office is going to have its work cut out for themselves in explaining why Buxton wasn't called up, especially now that he's performing (even in a small sample). As for Mauer, I fully admit I want him back. At the same time, to keep him as a viable/valuable player, his playing time does need to continue to be cut back. In the first half, He can platoon to some degree with Tyler Austin at 1B, and Austin can DH against righties (might as well take advantage of Mauer's defense). In the second half, Brent Rooker may be in the picture. Also, we need to remember that Mauer will make like $5-8 million next year (if he chooses to come back). I can't help but agree with Judd Zulgad on this idea... that as Jim Pohlad made it known that whoever the GM was would have to keep Molitor around for a year, Pohlad may reach out to "Falvine" and say, if Mauer wants to come back, Mauer can come back. But I do think the key is having a frank discussion with Mauer about role and playing time expectations. I think he should maybe be limited to the 100 games started range (and some pinch-hitting/late-inning defense) time. "These are very important players, not to mention very likable players. So it creates an awkward situation when their own best interests conflict with those of the Twins." " I can see why this is a much trickier equation than some make it out to be. 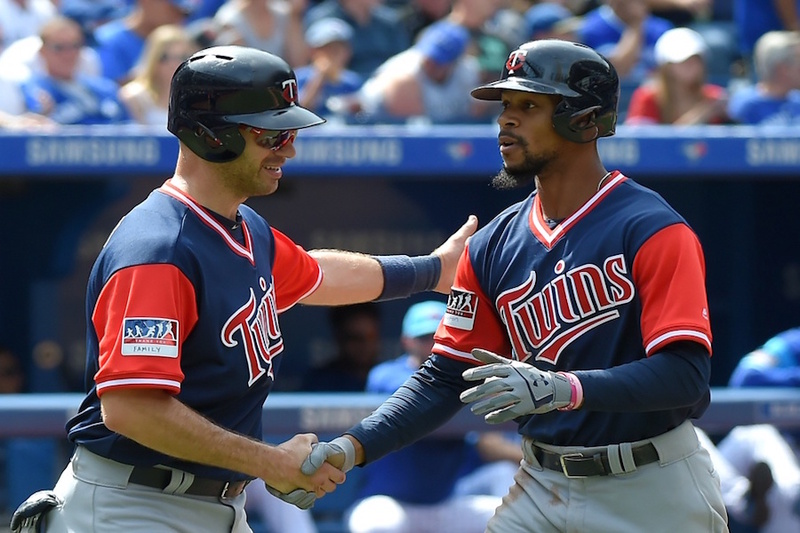 Especially when you consider the inherent questions around Buxton's health (which would seemingly benefit from an extra month's rest tacked onto his offseason), and the lack of available playing time in the Twins outfield." Nick, he is our starting center fielder and a platinum glove winner. He is playing in AAA and doing well. He is good to go. Stop talking like he is a Faberge Egg. Also, we need to remember that Mauer will make like $5-8 million next year (if he chooses to come back). Where does this number come from? Totally guesswork. But it won't be $13-23 million and it won't be $1-2 million. So, I can broaden it to $3-12 million. 'Wood, I'm feeling you, and that is what is going to happen. I for one want more Mauer at bats with RISP. He's our starting center fielder at AAA right now, not in the majors on a team that has given up and is playing young guys. He's been doing well for a tiny sample size, so now he's good to go? Methinks if you bring Buxton back up and play him every day he's going to hit .160 again, but perhaps not. The extra year of control is also intriguing... the only thing I can say is that the decision isn't cut-and-dry. Good article, Nick. I have the same mixed feelings on Mauer. I don't really want him back as a full-time starter next year as I think he will slightly regress from his 2018 season simply due to age, but he'd be great to have as a pinch hitter/platoon role player. Might need to carry 4 guys on the bench if that's the case, though. On Mauer: As you said, it seems pretty clear that Joe's calling the shots, so we'll see. He still takes great at bats and is as good in the field as he's ever been, but at 36 next year he's just not going to play that often. It's pretty tough in the days of 13-man pitching staffs to carry multiple first basemen. It's nice that Austin and Sano (among others) can play first along with other positions, but I think Joe's presence on the roster would take the Twins out of the market for any of the 1B/DH types that are going to be available. It's just really difficult to roster two of those type guys. I'm terrified Mauer's going to suffer another head injury in some freak way that ends up being life-altering, so I'll be happy either way. If Joe's back, great. If not, at least that anxiety has been lifted. Plus, considering his playing time and positional limitations, there's definitely a chance this team may be better off without him (depending on the replacement options). On Buxton: Should the Twins deep down be rooting for a way to get that extra year? Absolutely. I'm surprised they're not lining his hotel rooms with bear traps right now. But keeping him down if he's healthy would be a terrible look. Can Byron do anything about it? No. Will other players/agents take notice of a stunt like that? Absolutely. What would be the consequences? I could see free agents viewing Minnesota as (even more) undesirable andcurrent Twins ruling out extension talks. I'm guessing this front office doesn't exactly have a sterling reputation among the guys in the clubhouse. This would make that even worse. It could even impact things all the way down to the draft. These days, teams have deals worked out with their picks in the early rounds before they're selected. If the numbers are close enough, would you want to reach an agreement with a team you suspect is holding down its young players in an effort to limit their earning potential, or somebody else? You just don't want to be tied to service time manipulation. Ugly reputation to have. Even if Byron was hitting .100 in Rochester, there's still plenty of reasons why you'd want to get him more plate appearances, or at the very least use him as a late-inning pinch runner/defensive replacement. What about the other circumstances in which service time has been manipulated? Those have primarily come at the beginning of a player's career. It's much easier to justify keeping a rookie off your 25-man roster early in the season than it is to keep a guy who got MVP votes and who was voted the best defensive player in the game off your roster that can be expanded to 40 spots when he's got nowhere else to play. I get so tired of hearing about this extra year of control of Buxton, we have a brand new stadium which was going to allow us to pay to have good players for Pete's sake. if he's having a good year when it becomes time Pay him. I don't disagree with a lot of what you're saying, but I go have to say, while technically true to say Buxton got MVP votes- Really??? I feel Pohlad will make the call on Mauer.As far as Buxton he is an asset if he can hit .240 at this time.But the extra year of control makes this a no brainer.Have him get the extra month of rest and see how he does in the spring. For me signing Mauer for more than a 1 year contract may well cause issues.It looks like we will have Lewis or kirloff here in 2020 baring a setback. And would rather have Escobar signed using some of the money for Mauer than bringing Mauer back. The shrewd move is to shut Buxton down. The shrewd move is to offer Mauer a one year deal at a part-timer salary and let him know his role has changed. I agree with you completely on this article. I couldn't have said it much better. Joe was in a slump recently and sat maybe 2 of 5 games. He has bounced back a little. That shows me that the grind is not kind to Joe. It will be interesting to see what they do with these to, and the MOY, who I feel has not been great this year. There is so little risk in keeping Buxton down from a FO stand point. But lose the extra year when the late bloomer reaches his potential and you'll be remembered as a the fool who traded 20 games of crap Buxton for a year of MVP. Byron has no one to blame but his own dismal results for much of 3 wasted seasons for this situation. If he stayed healthy and hit, service time wouldn't be a concern. If he stays healthy and hits, he'll get a fat extension buying out arbitration. Byron Buxton hasn't done enough to suggest that we owe him anything. I think playing him over Cave or even Grossman at this point would be unfair. What free agent would want to play for a team who's willing to replace you with a guy you're badly outperforming? Cave deserves his shot, Grossman has earned his spot for this last month. Good article. I am a big fan of both players, but you have to make smart decisions. Lost year for Buxton, but it's not the teams fault. It's hardly a Kris Bryant situation where management is just keeping a player in the minors to extend control. Joe was great in his prime, but that was quite a while ago. If he wants to come back on a 1 year contract that's fine. If not, then we just have to appreciate the time we had watching him play for the Twins. Right now Mauer is 2nd on the team in batting and #1 on OBP. Pretty sure by the end of the year he will be the top in both. His BA is 33 points higher than the team average and his OBP is 40 points higher and 23 points higher than the next guy. (Garver).Forget how he rates with other 1st basemen. This lineup just isn't the same without him in there.He is a rock amid a team of streaky guys. I want him back and not just as sentiment. I don't think he has had such a bad year and I like him in the #1 or two spots.Fans don't seem to like table setters anymore.I still do. Mauer and Buxton are also tied together in a different way, an abstract way, the way Mauer and Dozier were tied together the past few years. Huh? Hear me out. There have been countless arguments as to Mauer's "worth" the past few seasons. The negative has always been lack of power and RBI production from a position known and accepted as the norm to produce power and RBI. (Though you could also make an arguement that despite Joe having a great career BA with RISP, he often hasnt had enough guys actually IN scoring position when he hit, or protection behind him). But I have always argued there are many ways to build a lineup. To be short, I've seen zero power hitters who could hit at least some, but steal tons of bases at the top of the lineup. I've seen guys who can barely run, but could hit, have high OB, provide at least decent power, and be highly successful in the same top of the order spot. Mauer is more than OK as a defensive star at 1B with his BA, contact, RISP BA, high OB and decent power, (at least the doubles variety with occasional HR pop), when power was provided at a different spot in the lineup, ala Dozier at 2B. The same holds true in regard to Buxton. Buxton's natural talent, strength and ability, IMO, would indicate that even as a "healthy" player hitting in the . 250-.260 range, could/should produce 30+ doubles, upper teens and very possible 20 HR power, not to mention multiple triples as well as his SB potential. (Yes, I know we're talking health and a miserable season, but follow me here). Combine that with Rosario and the still developing but talented Kepler, along with Sano and a full season of Polanco, etc, etc, and I hope you see my point. Mauer, at the top of the lineup, playing Gold Glove caliber defense, not only has a place, he can be productive, despite not being the classic 1B. He's been that, though Molitor was way, way too slow to swap him with Dozier. He was that in 2017 and the first half of this season. Can he be that still? That might be the real question. The second half Mauer after his latest concussion or "concussion-like" injury? He is a great defensive 1B who can still hit, get OB, take great AB, come through in the clutch at times, but is an 8 or 9 hole hitter who helps turn the lineup over. Is that good enough? Is the lineup strong enough to support that? Who else hits in the #1 spot? Polanco? Maybe. But I actually love the way Molitor has used Polanco as the 2-3 hitter late in 2017 and this season on his return. All I said before but adding this: He has reached certain milestones this season. He has endured yet another injury that curtailed what seemed like a positive offensive season. (Not that he's stinking up the place at all). He watched his brother walk away from the grind, even as a manager, to spend time with family, and Joe has another baby on the way. I think he's 50/50 Even wanting to come back. I'm torn as a fan of his, and a Twins fan for what is best. He has value, though it's argumentative and debatable how much. If only we had a crystal ball! I will repeat that I hope his decision is made quickly so the Twins can plan accordingly and move forward appropriately. Not surprisingly, what is best for Buxton is what's best for the Twins. Can anybody really argue that? I absolutely understand the argument for another year of control. Makes sense. But is that really the conundrum at this point? Put it in a weird and abstract point. If you could show ownership and FO on down that changing cleats and bat manufacturing company or a rabbits foot in his hip pocket would allow Buxton to reach his full potential in 2019, or even 2020, that they would truly care about the extra year, would they really blink about having to play him the rest of this season to lose that extra year of control? I'm sorry, but I say no. And that is what they have to decide and then sell to Buxton and maybe his agent. (Sorry, but this is an isolated case, and not organization wide situation to sell to potential draftees and potential FA). Is he truly better served coming back up, playing every other day, or 2 of 3, working with Rowson, hitting off the T, working in practice, and just studying and playing. Or is he better off, long term, getting an extra month to get his body and mind right for 2019, still working with Rowson, hitting off the T, maybe spending some time in instructional league, and getting right for 2019? I'm glad I don't have to make the decision. If I had to? Bring him up, play him,and work with him. Regardless of which course they take, I'd have special assistant Hunter spend as much time as i could about hitting, defense, preparation, WALLS, selling out and when NOT to sell out, approach, ups and downs. I’ve heard lots of people say bring Mauer back in a “more limited role”. He’s going to play fewer than 90 games at first this year and he’s likely going to start fewer than 115 games total. 1) How much more limited would you expect his role to be in 2019 (and beyond)? 2) How much do you think that amount of playing time coupled with his subpar offensive production is worth? 3) Perhaps most importantly (and an issue no one advocating for his return has bothered to address), how do you fit essentially a half time player who plays only first base onto a roster that has 3 position players per game that don’t start? Someone said in one of the Forsythe threads that a championship team doesn’t have Logan Forsythe on it. IMO, a championship team doesn’t have 36 year old Joe Mauer on it. You're right, it's a lot more impressive to say he ranked 11th in the AL in bWAR. I have always felt it was not fair to Harmon Killebrew, nor to the Twins' fans,that Harmon did not finish his career as a Twin. I felt that for all the wonderful gifts Harmon gave to the Senators/Twins and the fans, he deserved to end his career as a Twin. I wanted him to be a Twin for life. I didn't want to share him with the Royals. I feel the Twins owed it to him to keep him, even if he only hit .199 with 14 home runs his last year, when he was a Royal. I would hate to see Joe Mauer end his career as a Royal or a Tiger. I may be the only one, but my love of the Twins is about so much more than winning. It is about family. I think the decision is fairly easy with both players. The real issue is that fans won't like either... and I'm not talking the diehard fans that post here, but the casual fan. Buxton shouldn't come back up. I wouldn't even plan on Buxton in 2019. I'd tell him to go to Fort Myers and start bulking up and to expect to start 2019 in AAA. He'll come up when an opportunity presents him self and he is healthy and has a better hitting approach. A good approach is akin to a good habit. It takes time and reps to form, and it's hard to form it at the major league level. I'd find a 1 year stop gap to man CF if they don't think Cave is capable of doing so. You can always trade/DFA said player if Buxton is destroying AAA. As for Mauer, I think he can help this team win games in a part time capacity (note that I'm not convinced that our mgr would play him in said capacity). Even his "solid" season from last year was good, but nothing special at 1B. It would have been more valuable had he shown the ability to play some 3B or RF... and for the life of me, I'd love to know why he hasn't gotten reps at 3B. It's a similar set of skills to play 1B, and he has the arm to go with it... But I digress... Mauer is definitely the guy I'd sub in for a weak hitter in a tight late game, knowing he's going to take a good at bat and could be one of the best bench bats in terms of not making an out. The problem is that you need someone(s) who can provide some positional flexibility to take advantage of that... So we need an Escobar or two. I wouldn't had Mauer a starting job. I'd rather go after a guy like Nelson Cruz to pair with Austin and have an established bat in the lineup to compliment what I hope to be a good season from Austin. Bring back Mauer on a 1 year deal in the $7-12m area. And please have him be our extra bat on the bench. Let him start 60-80 games and the rest use him to PH. I have expressed my indifference on Mauer in other posts.I am not bothered with either decision on him, he is near the end, which is when players typically reach milestone numbers. But Buxton is the one who perplexes me.What I cannot know and is the crux of the question is - will Buxton in 2019 be better for having September in the majors or will he be better by taking an extra month off? I know Buxton has physical issues, but I believe that mental approach and thought process have as much to do with his success.Good luck figuring out this issue.